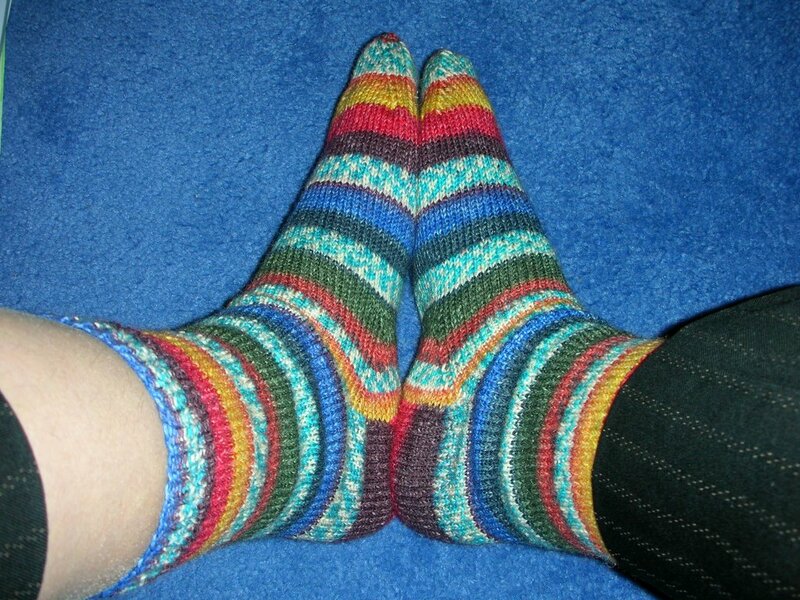 FOs include Drizzle which I love and wear every day and the recently finished stripy socks (which I’m wearing now). I have also made good progress on Electra (half finished and still waiting for me to sew in the ends). The baby jacket has paused while I do exciting things for me – but hey, the baby isn’t due until July. Caroline hasn’t even started but I think I need to finish Electra first. 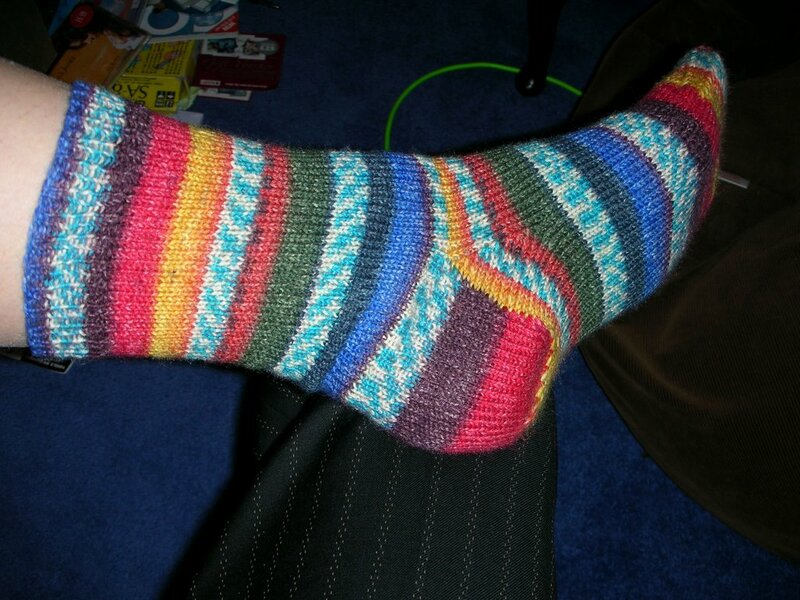 ~Some more socks for the beloved fiance as well as for me. 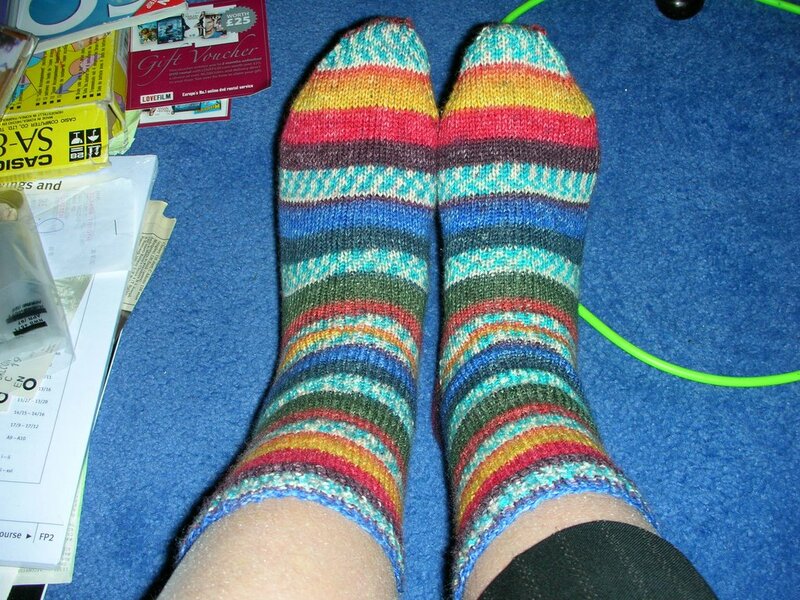 the BF would like some stripy funky ones and I fancy trying a cable pattern or something similar. I will have to investigate some of the free patterns on Knitty. ~I have seen Claipotis a few times on blogs and I think it is lovely and very tempting. I think it’s the way it drapes. ~I also have a hankering to do a project in some lovely Gelfrida yarn that House of Fraser sells but I have yet to find the right pattern – perhaps Claipotis but I need to check the yarn weight of Lorna’s Laces Lion and Lamb first. ~And finally, with my eyes really far too big for my knitting ability I give you this Is it not just beautiful? I’d better find out what cobweb yarn looks like and give it a whirl…. or maybe not! In logging on to write this post I have realised that actually I haven’t blogged in a little while which is rather remiss of me. The reason (and perhaps my only excuse) is that I have been very busy at work recently and I have been doing the come home go straight to bed kind of hours whicl culminated in a working day of 17 hours yesterday – ouch and so very sleepy – neither my boss nor I actually made any sense this morning until lunchtime when we seemed to wake up. And then of course we spent the afternoon looking at the SNOW!!!!!!! You have to excuse my excitement with snow – I didn’t really get snow as a child and I suspect I have made only 2 snowmen in my life (and the second was when I was 24!). My boss think’s it is hilarious and had a bet with a colleague that when he got back from lunch I would be found, nose pressed against the window – the first I knew about it was a voice behind me saying “I knew it!”. Hmm – more work less snow-gazing required by employer I suspect. The checky bits are actually turqoise although they come out as green on my computer. I am so pleased with them and I am wearing them as I write – it actually took quite a lots of effort not to put them on straight away once I finished them in the train on the way home! 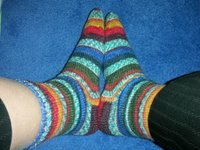 I am very proud of the matching as it was a bit hit and miss – a tip to myself for next time – for yes there will be a next time, I feel sock knitting may be a repeat mission – and my (poor) delighted family will end up with socks for Christmas for ever! I used most of 2 50g balls of Fortissima Colori Socka Color Socka Mexico in Fiesta (9075) on 2.5mm DPs. The socks are knitted in the round on 64 stitches for my size 8 feet (plus I have chubby ankles). The pattern is top down with a 15 round rib and then stocking stich to web of wool’s pattern – very simple and very nice to use to show off a big repeat pattern. The question is….. what to do next!